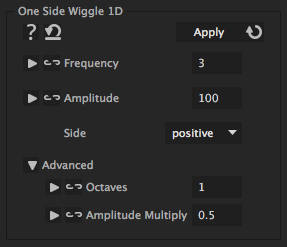 This wiggle allows to wiggle only on one side, i.e. positive or only negative. If you choose positive, the wiggle makes only values larger than the keyframed one, if you choose negative it only makes smaler ones. positive = each wiggle makes the value larger than the keyframed one, negative = each wiggle makes the value smaler.